One of my Texan friends loves to remind me that Texas is the only state that was also a country. (He’s an Aggie, by the way.) Well, the University of Texas Athletic Department will soon have enough cash money to buy up a country or two. As long-rumored, UT and ESPN have entered a deal to create a new Longhorn TV network that will pay the university $247.5 million over the course of 20 years. An additional $52.5 million is earmarked for IMG, which is UT’s media licensing partner, which adds up to $300 million overall that ESPN is throwing down for this new property. Believe it or not, this deal is what’s going to keep the Big 12 together. UT gets to make more TV money than any other school in the country, play its rivals in all sports and keep the Texas state politicians happy. As a result, UT is in a perfect spot and as long as they want to stay, the Big 12 will live on. Could UT make a few more TV dollars down the road by becoming independent? Sure, but that’s ignoring the fact that UT isn’t in complete control of its affairs in the same way as, say, Notre Dame, who only has to answer to its own alums. UT’s leadership has to deal with state legislators whose loyalties may lie with Texas A&M, Texas Tech or Baylor. Drawing the ire of those politicians that hold much greater purse strings beyond athletics, much less giving up its rivals and relegating its non-football sports to secondary status (noting that UT isn’t a one-trick football pony with across-the-board strong programs in basketball, baseball, softball, track and field, etc. ), simply isn’t worth the extra money that might be there for independence. UT has exactly what it wants: a conference that it controls with a TV network that it gets to keep all to itself. It’s the best of both worlds. Other schools in the Big 12 can complain, but as I noted last month, the conference is safe in a maximum security prison way. No one’s getting out of there even if they want to very badly. What’s ESPN getting out of this deal? On its face, $15 million per year appears to be a whole lot of money for 1 football game per season, a handful of men’s basketball games and a bunch of Olympic sports. However, we need to look at the big picture beyond Texas. 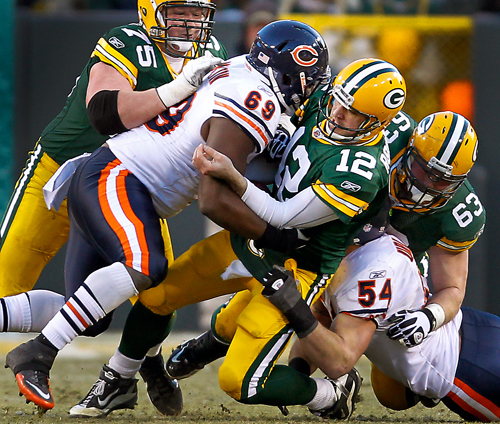 Think of the old sports adage that the best offense is a great defense. For ESPN, the creation of the Big Ten Network was a nightmare. Conference networks, whether real or imagined, created a viable threat for leagues to use in negotiations to drive up TV rights fees for college sports. As a result, the last thing that ESPN wants to see is for any of the other BCS conferences to form their own channels with competitors such as Fox and Comcast. (The Mountain West, on the other hand, can go start up 10 channels for all it cares.) Well, for a mere $15 million per year in payments to UT and IMG, ESPN has completely destroyed any chance of a Big 12 network EVER forming. Spending $15 million per year now will likely save ESPN tens of millions of dollars more in rights fees for the overall Big 12 package (assuming that it bids on it) in the long term. At the same time, ESPN has taken the position that superconferences are bad for its business, as they would also drive up rights fees. That’s why they were willing to step in and aid in saving the Big 12 by paying the same amount for a 10-team conference without a championship game as a 12-team conference with a championship game. The new UT network effectively ensures that the school will stay in the Big 12 for at least the next 20 years. With UT off the market, the Big Ten, Pac-10/12 and SEC are going to have a difficult time to financially justify expanding past 12. So, ESPN’s $15 million per year for the UT network is insurance against having to spend literally hundreds of millions of dollars in extra fees for superconferences. The ESPN UT network is likely going to profitable by itself (as with only one mouth to feed, it will take a fairly low basic cable subscriber rate across the state of Texas to make money), but preventing other conference networks and superconferences from forming is where ESPN is getting the most value of all. 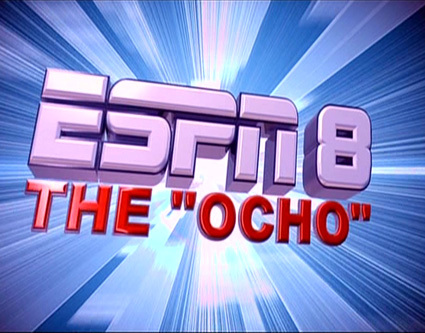 The Ocho has finally arrived.